Representative micrograph of Synechococcus sp. 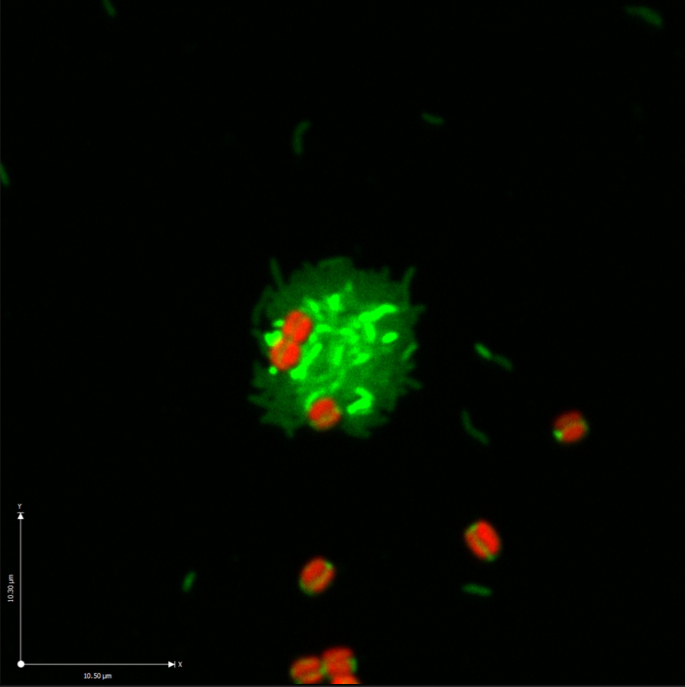 PCC7002 (red) and Shewanella sp. W3-18-1 (green) cell aggregates formed in a co-culture grown under carbon-limited aerobic chemostat conditions using lactate as the sole source of carbon. Enlarge Image. "Our experiments suggest that material and energy flows in microbial communities strongly affect the nature and direction of interactions between primary producers and heterotrophic consumers," said Dr. Alex Beliaev, a microbiologist at PNNL and lead author of the publication. "Knowing the fundamental rules that govern the functioning of complex biological systems will inform science and policy challenges associated with environmental stewardship and climate change. It will also guide development of technical programs, including biodesign of stable microbial communities for bioenergy and environmental applications." Methods: The researchers carried out controlled cultivation experiments in a custom-made photobioreactor at PNNL. They applied deep RNA sequencing technology and metabolite profiling using instruments at EMSL, a U.S. Department of Energy Biological and Environmental Research-sponsored national scientific user facility at PNNL, to delineate the specific gene expression response of each organism to co-cultivation and investigate the effect of carbon flux partitioning on the organisms' interactions. What's Next? The team is extending the investigations to an array of diverse microbial systems, which will allow them to identify "generalizable" interactions that drive energy and material exchange in microbial communities. Putative interactions, observed at the genome scale through transcriptional response, can then be tested in communities that span a range of unique environments for life, including geothermal hot springs and hypersaline lakes. Sponsors: U.S. Department of Energy Office of Biological and Environmental Research Genomic Science Program under the PNNL Foundational Scientific Focus Area. Research Team: Alex Beliaev, Margie Romine, Hans Bernstein (Linus Pauling Distinguished Postdoctoral Fellow at PNNL), Meng Markillie, Nancy Isern, Will Chrisler, Eric Hill, Steven Wiley, Jim Fredrickson, and Allan Konopka, PNNL; Leo Kucek, Bryan Linggi and Grigoriy Pinchuk (all formerly of PNNL); Margrethe Serres, Marine Biological Laboratory, Woods Hole; and Donald Bryant, The Pennsylvania State University.